GCU News Bureau GCU’s Strategic Educational Alliances hosted Mathematics Engineering Science Achievement Day recently at Apollo High School in the Glendale Unified School District. This was the annual statewide competition for middle and high schools enrolled in MESA. Teams presented their designs in response to nine engineering design challenges provided by Arizona MESA, from a golf ball delivery challenge to a duct tape/cardboard canoe event and a cellphone accessory design challenge. More than 45 GCU student volunteers helped with this event. Also attending were GCU’s chapter of HOSA-Future Health Professionals, as well as members of the Innovative Computing and Robotics clubs. GCU News Bureau A team of GCU Research and Design Program students working under College of Science, Engineering and Technology professor Dr. Ramesh Velupillaimani and a student of Dr. Karen Denzler from the Center for Antimicrobial Products recently presented their research findings on antimicrobial products from desert plants. The presentation was made April 21 at the 57th annual meeting of the Arizona/Southern Nevada Branch of the American Society for Microbiology at the University of Nevada, Las Vegas. It was organized in conjunction with the Arizona/Nevada Academy of Sciences annual meeting. Students who presented included Sonia Molina, Karla Villegas, Nicolas J. Sever and Brady Johnson. Here’s a link to the event. 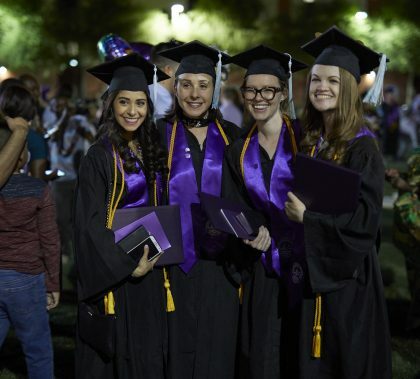 Photos by David Kadlubowski and Travis Neely GCU News Bureau Students from the College of Education and College of Humanities and Social Sciences participated in commencement Thursday evening in GCU Arena. To watch the ceremony, click here. GCU Today No runaway brides here! From Habitat for Humanity work project to wedding, GCU Enrollment Qualifying Specialist in the College of Education Laquisha Myles wasn’t messing around on March 9, when she volunteered with colleagues in the morning and then donned an exquisite gown in the evening to exchange vows with her now husband. Habitat for Humanity liaison Cassandra Jarles said, “It truly was inspiring and humbling to see such commitment to the community from a GCU employee.” We agree – congratulations Laquisha! Photos by David Kadlubowski GCU News Bureau Ethington Dance Ensemble wrapped up its 2017-18 season with “The Tipping Point,” its spring concert. 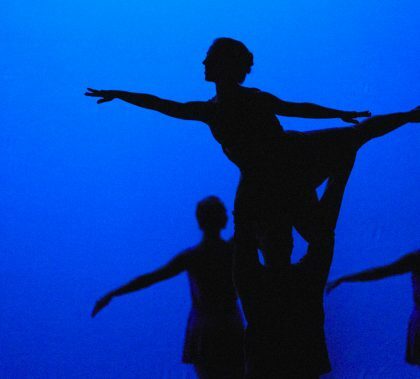 About 40 dancers brought to life 13 choregraphed works at Ethington Theatre. Stage manager Claire Schmaltz said of the concert, “It’s a very full-spectrum show this semester,” with dances ranging from jazz to tap and ballet. The Dance department’s artistic director is Susannah Keita.